Laid down, 24 January 1944, as MV Moses Pike, a Maritime Commission hull type (N3-M-A1) under Maritime Commission Contract (MC hull 650) at Penn Jersey-Shipbuilding Corp., Camden, N.J. 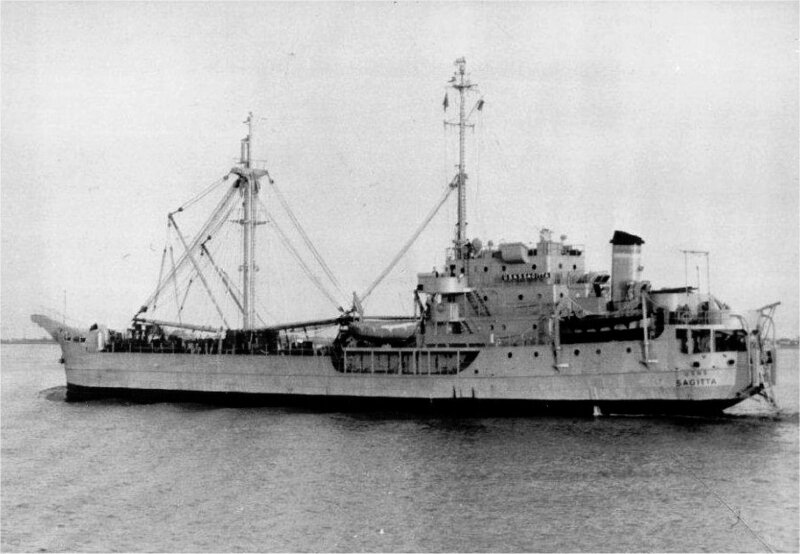 Renamed USAPRS Marvin Lyle Thomas, conversion to a a Port Rehabilitation Ship completed circa June 1944 at Bethlehem-Fairfield Shipyard, Inc., Baltimore, MD. Returned by the Maritime Commission, 27 August 1947, for lay up in the National Defense Reserve Fleet, James River Group, Lee Hall, VA. Transferred to the Maritime Administration, 23 February 1960, for lay up in the National Defense Reserve Fleet, James River Group, Lee Hall, VA. Returned to the Maritime Administration by the Army Department, 22 January 1976, laid up at Charleston, S.C. Bow Cathead Capacity 40 t.
three Diesel-drive 100Kw 120V D.C.
two Diesel-drive 40Kw 120V D.C.
105k USNS Sagitta (T-AK-87) under way circa the mid-1950s. Although she retains the Army cathead on the bow, she is shown here serving MSTS as a small cargo ship. The two masts reflect the final rig of the class adopted by the Navy in September 1943 and fitted to USS Enceladus (AK-80), but the built up hull sides from the forecastle to just before the bridge and the elaborate stern anchor date from the Army conversion. 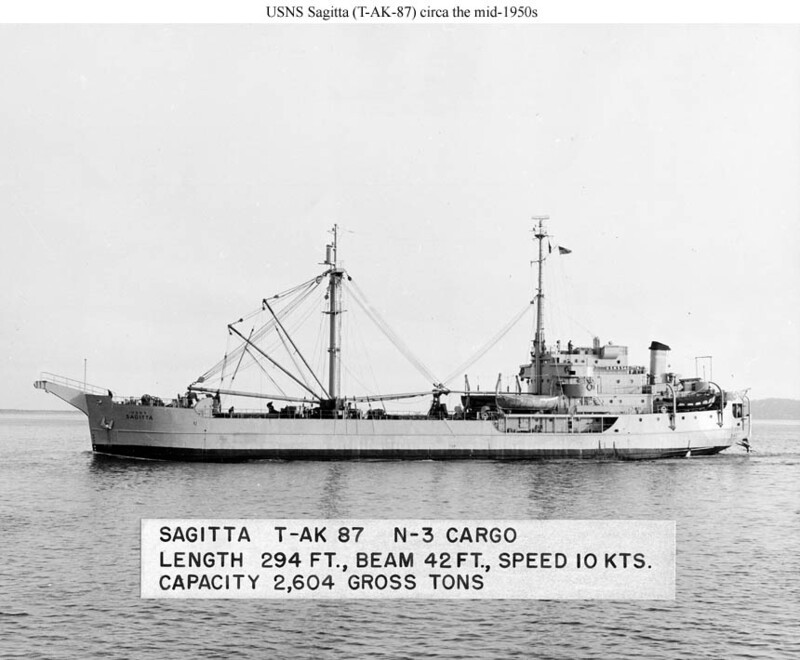 103k USNS Sagitta (T-AK-87) under way, date and location unknown. 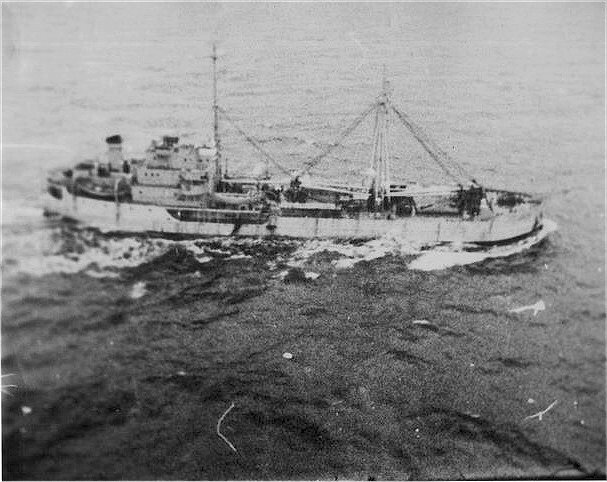 67k USNS Sagitta (T-AK-87) makes her way towards the port of Boston, 20 January 1956, after she rammed into a Texas Tower platform during a resupply mission. 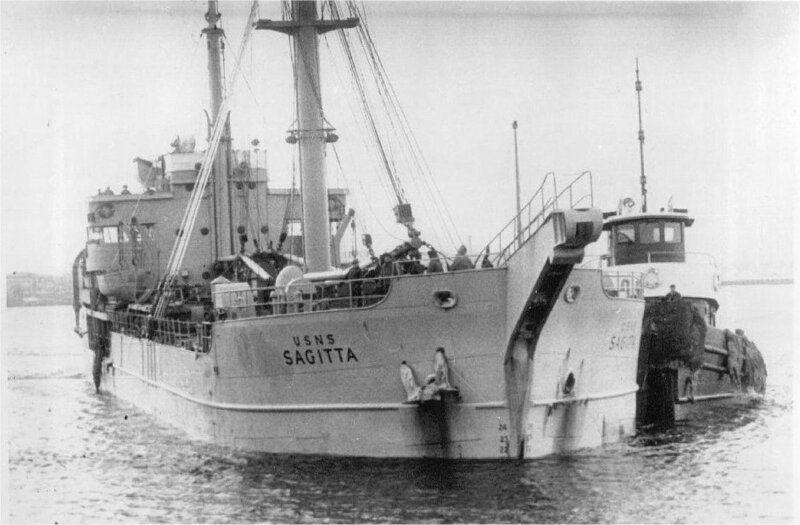 109k USNS Sagitta (T-AK-87) limps into her berth at East Boston, 21 January 1956, assisted by a tug. 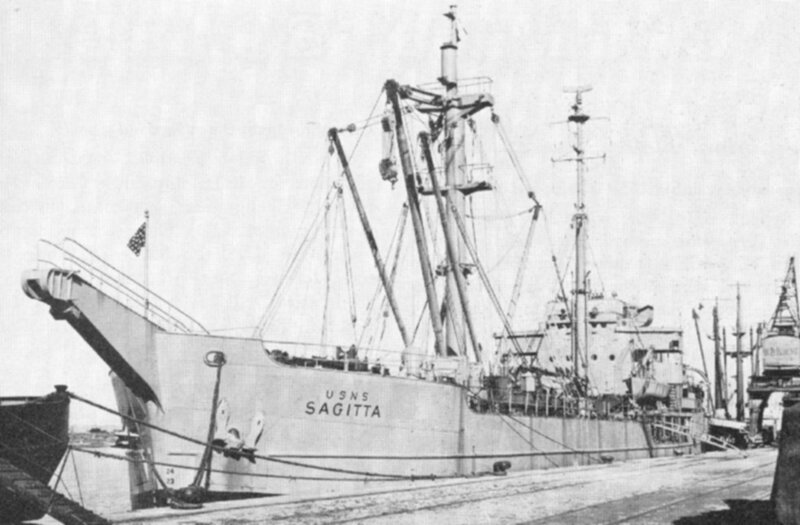 Sagitta collided with a Texas Tower radar island on 20 January 1956 during a re-supply operation. A hugh wave tossed the ship against the tower during unloading operations. No one was injured but the ship suffered a hole below her waterline. 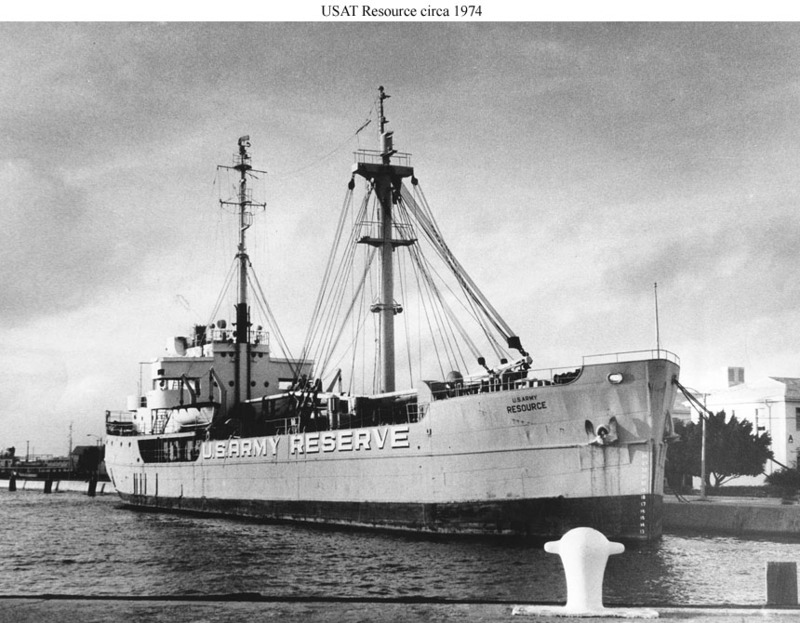 163k USAT Resource in use as an Army Reserve training ship at Bayboro Harbor, St. Petersburg, Florida, circa 1974. A press story dated 13 September 1974 stated that she was soon to be taken under tow to St. Mary's, Georgia, her machinery being unserviceable although her deck and hull were in good shape.